This is a do it yourself guide to a Gold's Gym 390R and Gold's Gym 290 power supply. This can damage your bike if you mess up. The safest way to power this bike is to buy a power supply from the manufacturer. 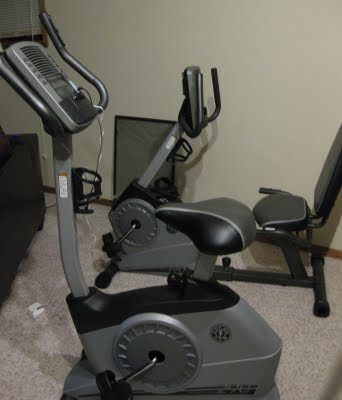 Just bought a Golds Gym 290 indoor upright bike. These instructions work for this bike too. Ahh. 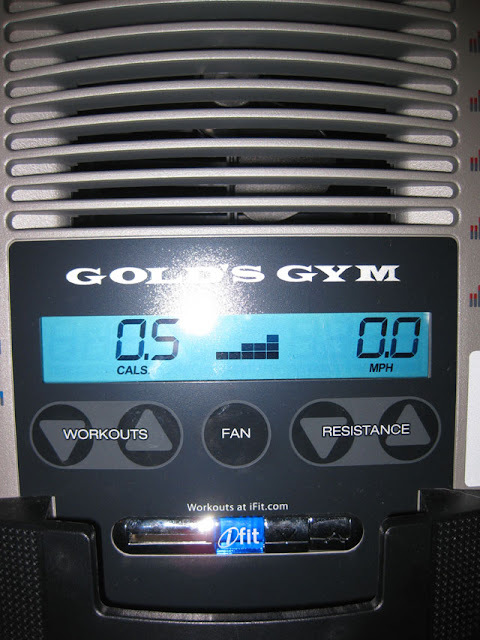 It's the wondeful Golds Gym 390R indoor recumbent bike it's a really nice machine. Has heart rate monitor and a lot of other cool electronics on board. The only problem is, THERE'S NO POWER SUPPLY!! What a total bummer. This dang thing drinks "D" cell batteries. We'll I'll tell you how I solved the battery crisis. I bought this universal power supply that powers this battery drinking machine. The radioshack enercell supply will solve our power supply needs. The supply will convert household 120 Volt current into a safe 6 Volt low current that the Gold's Gym 390R or a Gold's Gym 290 bike can use. It more than likely uses a small transformer with a bridge rectifier and a small capacitor to filter out the ripple voltage. This is the front left view of the bicycle. There is a plug located above the handlebars. 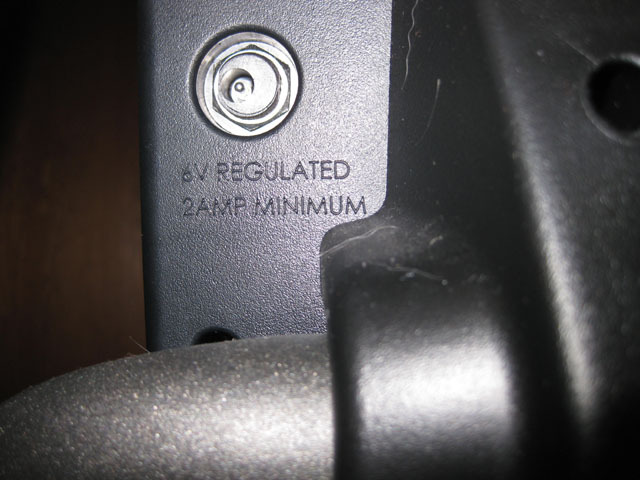 As you can see it says, 6V 2amp minimum. What that means in electronics terms is that this bicycle needs no more and no less that 6 Volts of electricity. The current of the supply need to put out a minimum of 2 amps or 2000ma of current. 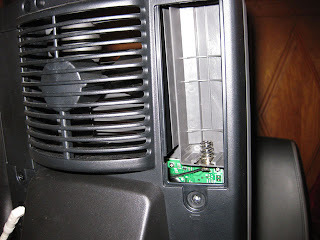 That solves halve the problem of the power supply. The other problem with the power supply is you don't know the polarity by the markings on the bike. 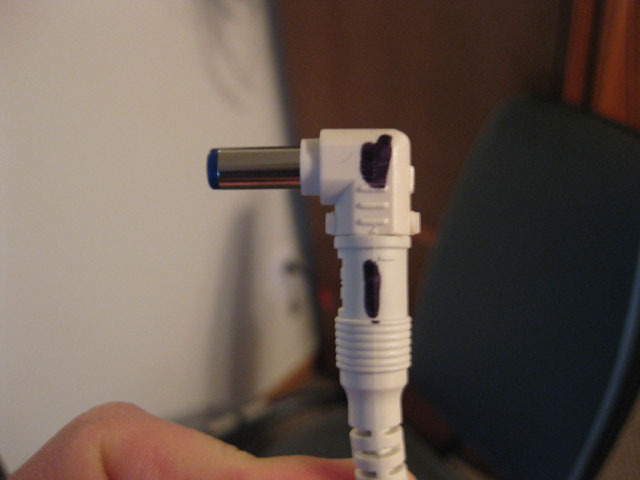 Polarity is very important, this is the direction that you plug something in. For instance, if you hook the jumper cables right on a car the car starts. If you hook the jumper cables up backwards on the car, sparks fly and stuff smokes and possibly explodes. Same with you bike if it's hooked up wrong. I'll tell you what my polarity was on mine. The center pin on mine was positive the outside was negative. I have no know idea if they are all the same. I'll show you how to check in a little bit. 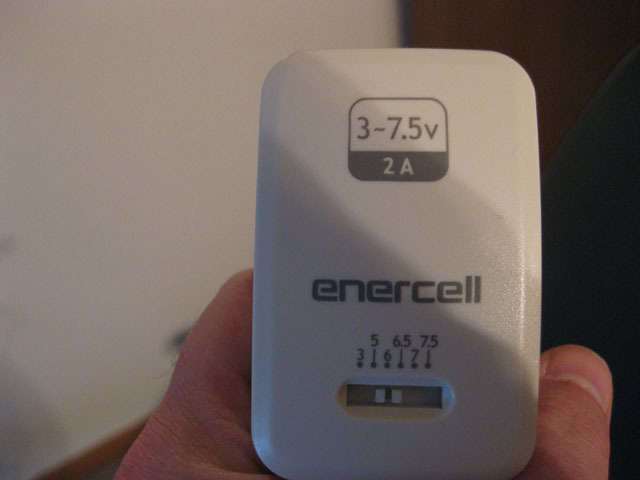 I used the Enercell Radio Shack Part Number 273-333. As you can see this supply meets our requirement for the bicycle. It is a variable 3 volt thru 7.5 volt. Put it on 6 volt and never touch it. Epoxy it if you think someone is going to mess with it. 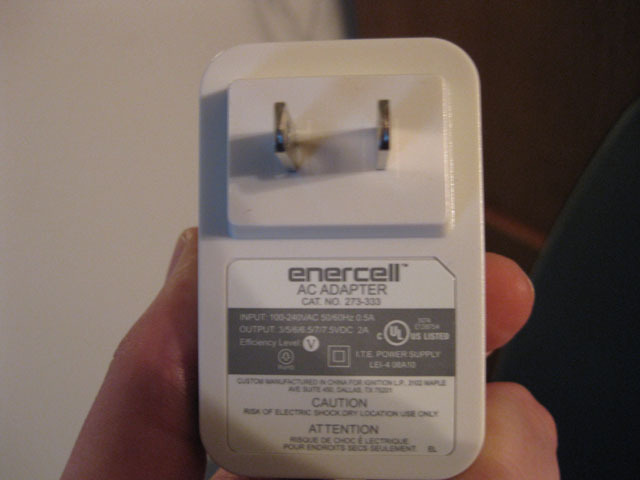 You will have to buy the "M" Enercell adaptor too. Not sure what the part number was on this, it's on the Radio Shack website. I bought this supply in their store. I'm guessing this bike needs the 2 amps for this fan power. 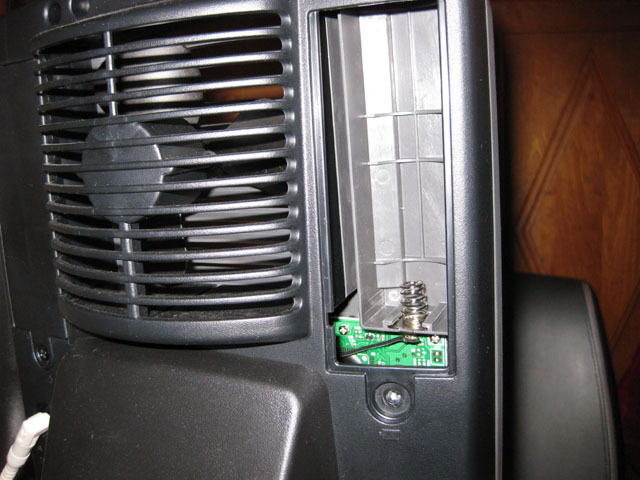 Not sure, maybe you could get the smaller amp rating if you didn't use the fan. I think the small supply would eventually burn out using a fan. The first thing I did was plug this adaptor, "by itself into the bike". I installed fresh batteries in the bicycle. I used a digital multimeter to measure 6 volts across the pins. I put my red "+" lead on the right pin and my "-" black lead on the left pin and I got a +6 volt on my multimeter. If I got a -6 volt on my multimeter then I would have known that I was hooking my meter up backwards. Now I know Right pin is Positive and Left pin is Negative. I also did a Ohm, or continuity check, from the center pin to the Right pin. I found that they were shorted. That is what I expected and hoped for. *Note: Take your alkaline batteries out of you bike when using a dc supply. They might try to charge with a supply. As you can see in this picture, there is a "+" above the sideways word tip below. This says tip is positive. Once I found out how to hook the plug up I marked it. I used a sharpie to mark the plug and the cord, see the "-" above the bottom mark. This made my plug a no brainer so I could figure out how to hook it up in a few secs if I ever needed to figure it out again. What happens if everything goes good? Yes!!! No batteries. No more dollars wasted on batteries!! Whoot Whoot. Be sure to Facebook Like my blog if you found this information helpful. 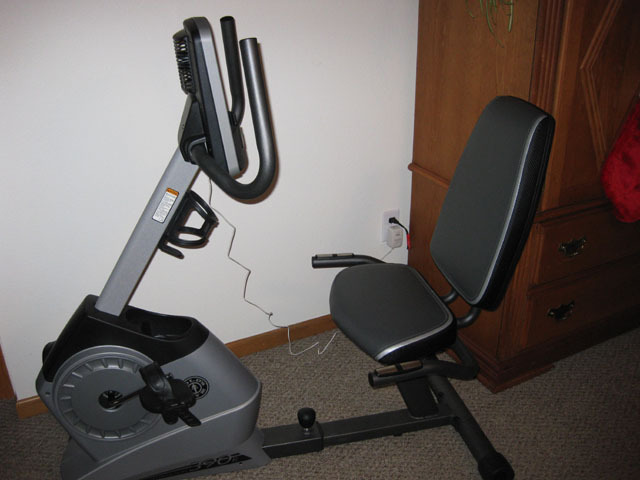 Check out Editor's Choice Fitness products for your fitness product needs. Thanks for visiting. The Radio Shack Supply will run $46.98 without tax. 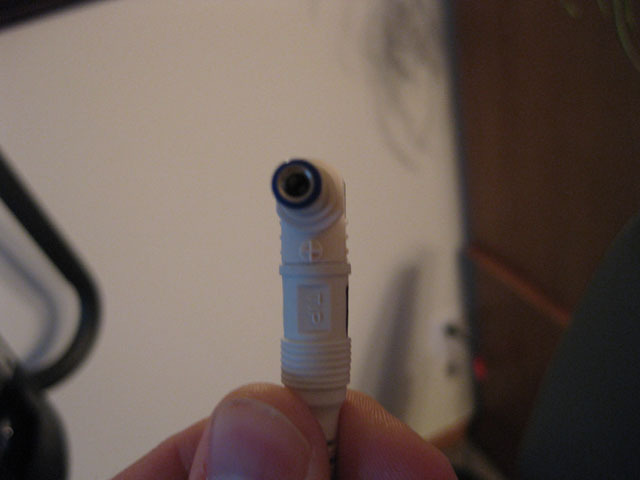 The advantage to this supply is Radio Shack usually have this supply and "M" connector in the store. 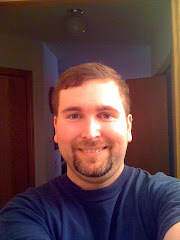 I would like to thank all the people that have visted my blog and have made it a success. If you use Nexercise for tracking your fitness goals and need a friend. You can add me. Happy New Years of 2013.